Start Luther Pass on Highway 89. End Pickett Junction (intersection of highways 88 and 89) in Hope Valley or west of Pickett Junction along Highway 88 wherever you can find a legal place to park off the highway. This is the end point if you choose to end the tour in Hope Valley. Waterhouse Peak is a magnet for South Lake Tahoe's telemark crowd looking for a quick fix. The hearty can skin up to the summit in an hour and descend in a fraction of that. Many choose to do a couple of laps on the mountain to prolong the fun. The draw is a steep descent that is notorious for excellent powder even days after it has stormed. The great conditions are a result of the northern exposure and dense, mature trees. The trees, though dense, are spaced wide enough apart to make a high speed descent fun, but not difficult. When spring comes, the southeast slope becomes an ideal corn-snow run. This option requires a shuttle car in Hope Valley. It also increases the descent to 2400 feet. Although Waterhouse Peak (the true summit) is not as popular as Waterhouse Peak's northwest peaklet (unofficially called Powderhouse Peak), it has the advantage that it receives less use and for some it has the advantage that the descent back to Grass Lake is a little less challenging. Although the climb to the summit of Waterhouse Peak is very steep, you can be assured that a track will be broken immediately after a storm passes. Just be sure that you have full-length and full-width skins in order to be able to follow it. Skiers not seeking a thrilling descent may still want to make the climb to Waterhouse Peak. The views are spectacular, you can explore the short ridge between the peak and the northwest peaklet, and you can end the day by descending to Hope Valley making for an interesting one-way tour. From the trailhead (1) ski south for 0.4 mile until the terrain abruptly becomes more steep (2). Climb southwest for 1.2 miles until you reach the summit of Waterhouse Peak (3). Descend north for approximately 1.0 mile until you reach Grass Lake. 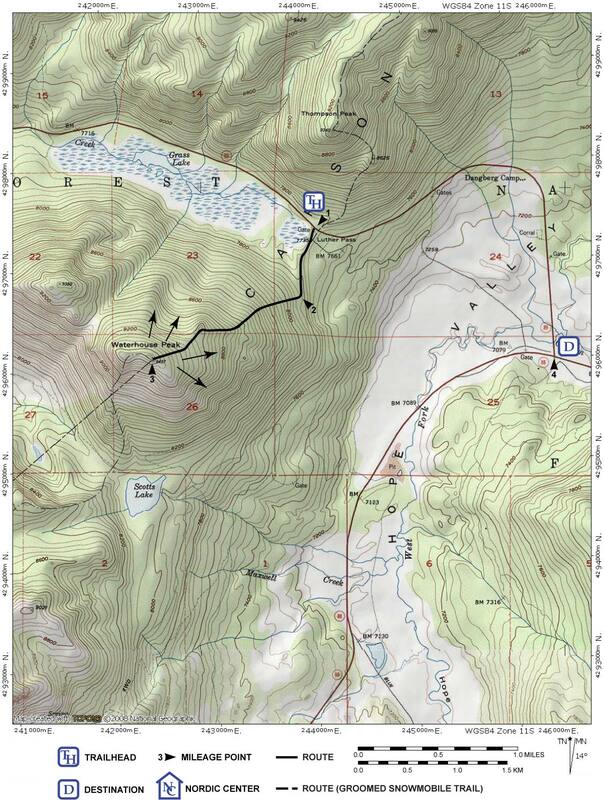 There is no correct route to descend; arrows on the map show the general direction. Ski approximately 0.6 mile east back to the trailhead (1). Descend east or southeast for approximately 1.5 miles until you reach the meadow in Hope Valley. There is no correct route to descend; arrows on the map shows the general direction. Ski approximately 1.1 miles until you reach Pickett Junction (4) or to wherever else you parked along Highway 88.